Hi friends, Denise here from SunnyDaysinSecondGrade. Here is what I'm looking at right now, this very minute on Sunday morning at about 11:00 A.M. Not too shabby, right? We're spending this Labor Day weekend with a bunch of great friends at the beautiful Hilton at Bonnet Creek in Orlando. I checked my email yesterday to find that I was awarded the TBA Top 10 button from two different bloggers. I was so overwhelmed and touched. I couldn't stop babbling and gushing about it to my hubs. I'm sure he was tired of hearing it, but he listened and gushed with me. Love him! So big love to Barbara from Corner on Character and Mel D from Mrs. Dillard First Grade for bestowing this amazing honor upon me. For real, it means the world to me! 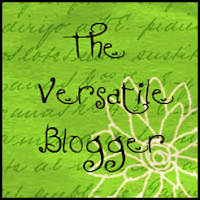 As if that weren't enough, I also got a note that Karla from Life in Special Education awarded me the Versatile Blogger button! How over the top is that? Can't get much better for a blogger in one day. I am going out to join my friends for some fun in the sun, but I have some awarding of my own to do when I get back to reality. I'll be thinking of my nominees long and hard as I float along the lazy river feeling just about as content as a girl can get. Big love to you all & have an amazing weekend!